Everyone thought they knew what millennials and their parents, the baby boomers, wanted in housing and lifestyle. They’re choosing to go their own way instead. It has not worked out that way. The two largest demographic groups in history are not behaving as many prognosticators thought they would. Millennials are having families and buying houses in the suburbs, just as their parents did. Instead of fleeing the suburbs, many boomers are “aging in place,” refusing to sell their large homes or give up their jobs. Faced with buyers who are not acting as expected, builders have been forced to reconsider their strategies. “Our business model has really changed in the last three years,” says Haythem Dawlett, principal of Austin, Texas–based Legend Communities, which has shifted its focus to active adult projects. Developers, investors, and analysts are racing to figure out what millennials and boomers really want. New opportunities are emerging as old models lose their luster. The community room in Headwaters, a new development in Dripping Springs, Texas. There is no denying the impact that millennials and boomers are having on the industry. Millennials— people 37 and younger—are the largest group of homebuyers in the United States, accounting for 34 percent of sales, according to the National Association of Realtors (NAR). Sixty-three percent of those millennial buyers were buying a home for the first time, according to NAR. “It’s ironic that we’re talking about when millennials are going to buy a home when they represent 30 percent of sales,” says Gregg Logan, managing director of RCLCO, an advisory group headquartered in Bethesda, Maryland. The era of millennials is only starting. In many ways, millennials are following the same pattern as previous generations. They are getting married, having kids, and buying a house in the suburbs. They are simply doing it later. In the 1970s, homebuyers typically spent about 2.6 years renting before buying their first homes; today, according to Zillow data, it is closer to six years. “When they get to similar life stages, they are making similar decisions,” Logan says. In 2015, millennials were the head of 16 million of the nation’s 124.5 million households; by 2035, they will oversee 49.8 million households, “and thus reshape housing demand in profound ways,” according to the 2017 The State of the Nation’s Housing report from Harvard University’s Joint Center for Housing Studies. As they begin having families, they are also buying homes: NAR’s 2017 study found that 49 percent of millennial homebuyers had at least one child, up from 43 percent in 2015. But only 15 percent of millennial buyers bought in an urban area, according to that same study, down from 17 percent in 2016 and 21 percent in 2015. 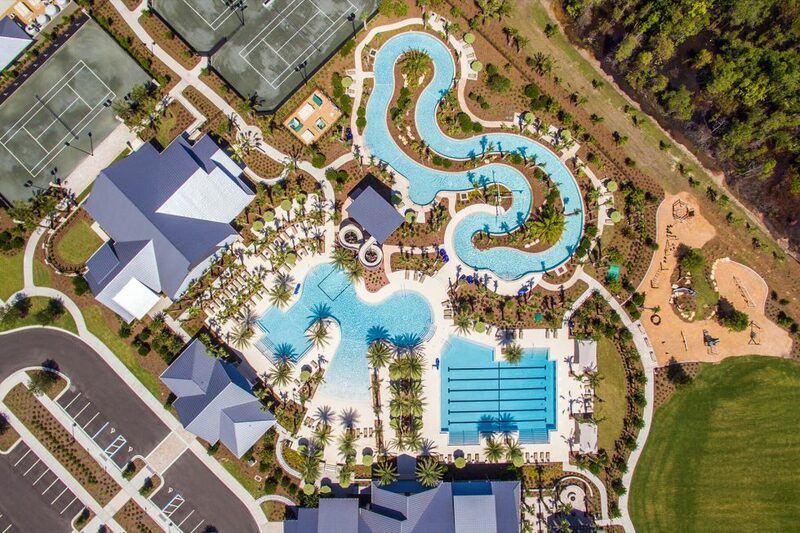 With competition for buyers increasing, Freehold Communities’ Headwaters master-planned community includes a resort-style pool and eight miles (13 km) of walking trails. Money appears to be the biggest issue holding millennials back. They are facing more than $1 trillion in student debt, according to some estimates. Fortysix percent of homebuyers under the age of 36 have student loan debt, with a median balance of $25,000, NAR reports. Skyrocketing rents and other costs have made it difficult for them to save money. The number of adults age 18 to 34 living in their parents’ homes increased to an all-time high of 35.6 percent in 2015, according to the latest American Community Survey performed by the U.S. Census Bureau. “They’re not postponing [decisions], life has intervened,” says Steve Burch, senior vice president of Irvine, California–based John Burns Real Estate Consulting, which tracks markets. As they grow older, millennials are demonstrating the same long-term interest in homeownership as past generations, analysts say. Sixty-eight percent of millennials look at their current home as a stepping stone to their next home, compared with 36 percent of the overall market, according to Bank of America’s recent Homebuyers Insights Report. Orchard Ridge in Liberty Hill, Texas, hopes to woo buyers with the promise of healthy living, including a community garden and local farmers market. But, in some ways, millennials are acting differently than their predecessors. For one, they are not as interested in new homes. The Bank of America study found that millennials are more likely than older buyers to buy a fixer-upper than a new home. “They grew up watching [house] flipping shows,” said Anita Kramer, vice president of the ULI Center for Capital Markets and Real Estate, at a recent event in San Diego. Millennials also have different priorities. A survey by SunTrust Mortgage found that more millennial first-time homebuyers’ decisions were motivated by a desire to have space for a dog (cited by 33 percent of respondents) than by a marriage or the birth of a child (cited by 25 percent and 19 percent, respectively; respondents could cite more than one motive in the survey). Accommodating a dog fell only slightly below the desire for more space and building equity as prime motivators for buying a home, the survey found. A five-acre (2 ha) community farm is the centerpiece of Arden, a 1,200-acre (486 ha) development in Palm Beach County, Florida. Certain stereotypes about millennials are grounded in fact: they want walkable neighborhoods with a sense of community that are close to restaurants, shops, and authentic retail, such as an antique mall, analysts say. They like smaller, efficient spaces; sustainability and technology are top priorities. The desire for urban amenities may be real, but that does not mean that millennials have to be in the heart of the big city. The largest growth in buying activity among people between the ages of 25 and 34 from 2010 to 2015 was in secondary cities like Riverside, California; San Antonio; and Orlando, according to RCLCO data. In Ontario, California, about 35 miles (56 km) outside Los Angeles, 43 percent of buyers in Brookfield Residential’s 124-acre (50 ha) New Haven development have been millennials, says John O’Brien, vice president of housing for Brookfield Residential Southern California. In some ways, the 2,500-unit, development, part of the 8,000-acre (3,200 ha) master-planned Ontario Ranch development, is exactly the type of outlying master-planned project that millennials were expected to avoid. “We’re still a little surprised how much we’ve seen this type of buyer,” O’Brien said. “Until a few years ago, we would have thought half of that.” But O’Brien says that millennials have responded to the community’s parks, swimming pools, wide variety of models, built-in gigabit internet service, and pricing, which ranges from the low $300,000s to the $500,000s. Brookfield also shifted its marketing to focus more on social media and virtual reality. “Millennials are the first ones to adapt to that stuff,” he says. Millennials have been grabbing the headlines, but baby boomers remain a large part of the story. The very oldest boomers, who were born in 1946, are turning 72 this year, but they are maintaining their influence as homebuyers and owners. By 2019, almost 45 percent of U.S. households will be headed by someone over 55, according to the National Association of Home Builders (NAHB). Like millennials, baby boomers, as they age, are acting differently than expected. “If any generation has demonstrated an extended capacity to surprise, it is the baby boomers, the so-called pig in the python of demographic studies,” ULI’s Emerging Trends in Real Estate® reported in 2017. Today’s seniors are working longer, staying active, and waiting longer to make their senior housing decisions. The boomer story “truly only starts to kick in with force around age 80 these days,” ULI’s Emerging Trends 2018 report notes. Many analysts predicted that boomers would leave their big homes in the suburbs once their kids moved out and they got tired of mowing lawns. And many cities, such as Philadelphia and Chicago, have seen a sharp uptick in downtown luxury condo sales to boomers moving to the city from outlying areas. But the big selloff in the suburbs has not happened, analysts say. “The reality is that senior citizens are predominantly staying in their predominantly suburban or exurban communities,” Wendell Cox, a principal in Demograhia, a policy and research firm, concluded in a recent article on NewGeography.com. Walking trails and a connection to nature are essential, analysts say. Instead of moving, many boomers are fixing up their homes, which will make them even more expensive for the next buyers. “The decision of millions of older households to age in place could also limit the supply of suburban homes available for sale to millennial households seeking to trade up,” the Joint Center for Housing Studies report concluded. But the market is bullish on senior-focused housing. In the fourth quarter of 2017, the NAHB’s 55+ Housing Market Index (HMI) hit its highest level since the inception of the index in 2008. “There hasn’t been that much product geared toward active adult [built] in a long time,” Dennehy says. In Palm Springs, California, an “agri-hood” with olive trees and walking trails is replacing a golf course. In terms of amenities, “it’s a whole different world,” Dennehy says. Yoga, cooking classes, and farmers markets are the big draws; golf much less so. Nature trails are the new must-have, Burch notes. “I cannot overstate how important trails are to all groups,” he says. A curated curriculum is key to any 55-plus project, says Haythem Dawlett, the principal in Legend Communities, which is focusing on the active-adult sector after years working on all-age communities. Dawlett believes the “sweet spot” is age-targeted projects of about 1,400 to 1,500 homes, which are large enough to maintain amenities and community activities. Scale is the key; a community with fewer than 300 homes is hard to maintain and becomes “really inefficient,” he says. He also targets price points between $300,000 and $700,000—higher than those seen at many 55-plus communities. At those price points, “the margins really start to grow,” Dawlett says. Dawlett is among the property executives who believe the future is in mixed-generation developments. As an example, he points to Rancho Mission Viejo, a master-planned development in southern California, where a gated 55-plus community with single-level houses is integrated into all-ages neighborhoods. The age-restricted neighborhood is separate and “tailored to a more grown-up, worldly perspective,” according to promotional materials, but residents also share many of the amenities of the overall community. Freehold’s Shearwater community offers a three-story slide tower, among other active amenities. In Palm Springs, California, famed for its retirement communities, Freehold purchased an abandoned 97-acre (39 ha) golf course after the 2008 crash and re-created the site as an agrihood, with olive groves, trails, and modernist-style homes. Scheduled to open this fall, entry-level homes start at $300,000, targeting younger buyers, although many of the elements are designed to appeal to Palm Springs’ traditional older clientele, Maddalon says. A yoga center and community gardens appeal to both groups, she says. In many ways, millennials and baby boomers are acting a lot alike, analysts say. They are working longer and spending more time working at home; flexibility is important to both. And they both like healthy living and the outdoors. Finding the specific solutions to meet the demand will be the challenge facing the industry in the years ahead, analysts agree. “As we figure it out, it’s a great opportunity,” Logan says. KEVIN BRASS writes regularly about property and development for the New York Times and the Financial Times.